For countries not listed above, please dial 00 800 3551 3551. This is a freephone number and contacts the English language support, but players from outside Europe may need to dial a different access code. To find the Freephone Number for your country, please see the FAQ section here. 1. Download Software – Download the most advanced poker software. It couldn't be simpler to install the poker software - visit our Poker dowload page and click on the Download Now button. The Poker software download will then start automatically as soon as the launch takes place. When downloading the software for the first time, our Step by Step guide will help you through the installation process. * A security question and the answerOur registration page checks your details as you enter them and will let you know if there's a problem, so you can make any changes you need to before you click on the 'Create My Account' button. 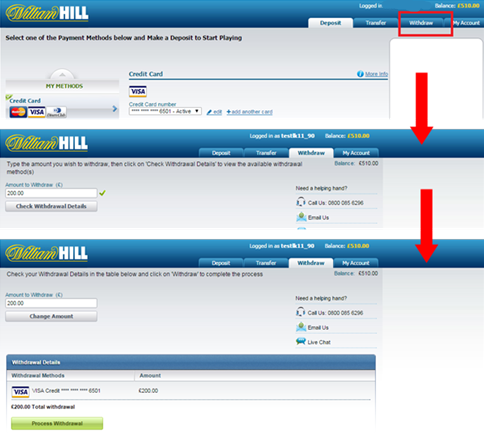 If you already have an existing account with William Hill, there is no need to set up a new one. All WH download software utilizes a shared login and wallet that allows you to play across all WH products. Simply download the poker software to start playing. Yes, our “Instant Play” platform is available for you should you don’t want to go through the process of downloading our software, see more details here. Yes, of you use MAC you can play using our "Instant Play" platform. click here for more details on Instant Play.. There is no option to play poker on mobile devices at the moment but it will be available later on in the year. Currently Poker is available on desktop via our "Download" or "Instant Play" platforms. There are three ways to deposit funds into your William Hill Poker account. You can make a deposit from William Hill Poker software , William Hill Poker website or William Hill Poker Instant Play. How do I deposit from William Hill Poker software? If you already have a payment method registered the page will automatically display your details, if not select and add one of the payment methods. Type the amount and click Deposit. Your account will be automatically credited and confirmation screen will appear. How do I deposit from William Hill Poker website? 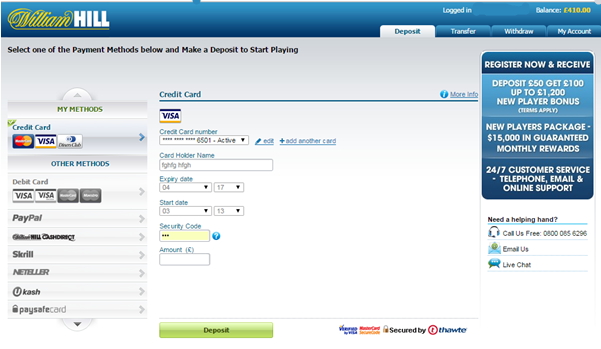 Go to William Hill Poker website, log in then select Deposit. Choose your payment method, enter the amount and click Deposit. In some cases your deposit might be added to your Main Account balance and not to your Poker balance. For more information on how to move the funds into William Hill Poker or Casino accounts please see our Transferring Funds page. 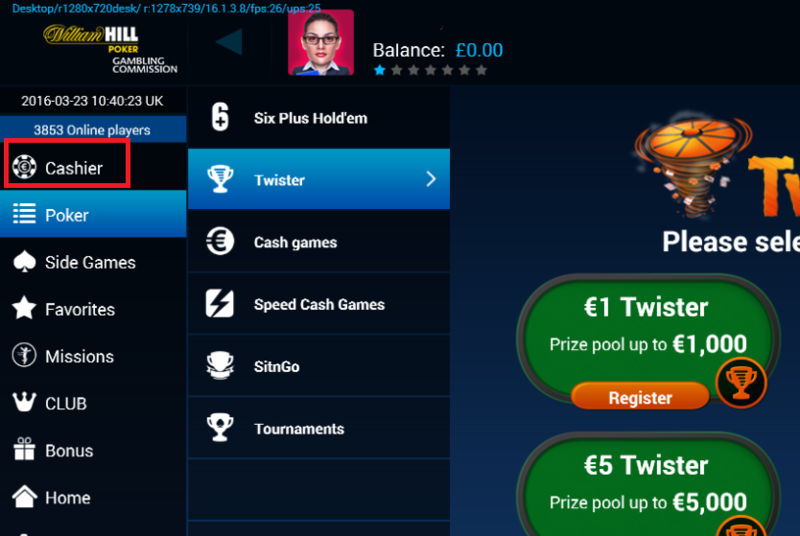 Open and log into William Hill Poker "Instant Play", then click on Cashier. * Log into William Hill Poker software, then click on Cashier. Confirmation of transfer will be displayed on the next page. * Open and log into William Hill Poker Instant Play, then click on Cashier. Poker website: To withdraw your winnings please go to poker website into “My account” and select "Withdraw"
Poker software: Click on “Cashier” -> “Windrow tab” and follow the steps. Poker “Instant Play: Click on “Cashier” -> “Windrow tab” and follow the steps. 4. Convert your Club Points for rewardsFor more information (including club status, swapping club points into rewards and earning WHPoints), check out the players club page.